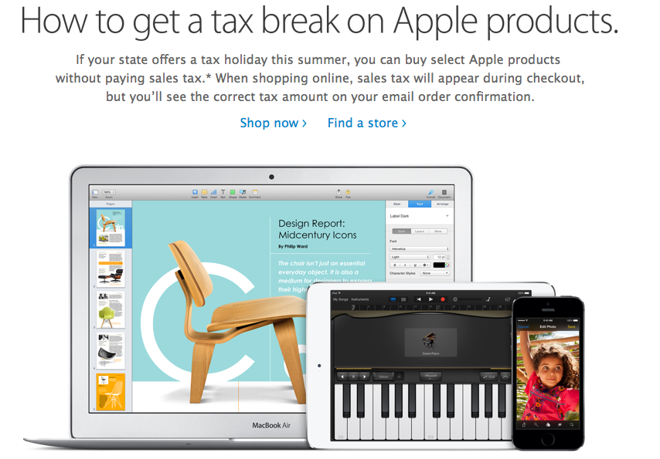 Apple on Tuesday launched an updated informational page, and corresponding email campaign, detailing how consumers in nine U.S. states can take advantage of back-to-school sales tax holidays for substantial savings on Macs and iOS devices next month. Eligible purchases include Macs, iPads, and most accessories, including mice and keyboards when purchased alongside a computer. iPhones, educational software, and AppleCare may be included as well, but consumers should review their state laws. It should be noted that most states place a cap on the portion of each purchase that is exempt from sales tax —the limit is set at $750 in Alabama and Florida, $1,000 in Georgia and New Mexico, $1,500 in Tennessee, $2,500 in Massachusetts, and $3,500 in Missouri. There is no such cap in South Carolina. The sales tax holiday period runs from Aug. 1 to Aug. 3 in every state but Georgia —where it ends on Aug. 2 —and Massachusetts, where it has yet to be set by the legislature for 2014. While consumers in North Carolina could take advantage of the sales tax holiday in past years, that law has now been repealed.